currently i have the impression that there is a new sensibility not to waste food and a critical focus on the habit to eat and buy only vegetables that look super immaculate, are totally symmetrical and give the impression that they have just fallen from the tree. but in reality, also an apple that is a little bit crumpled has still preserved his delicate flavor. maybe it is not attractive from the outside, but it is still good to cook and bake. with the very last apples i found in our cellar i did this awesome apple desert of sarah wiener, which i discovered on valentinas kochbuch. sarah wiener gave it the name apple snow, but it reminds me more of fluffy cloudlets. it is so light, soft and fruity. simply ambrosial! the apple snow, topped with some whipped cream and brittle, nuts or whatever you like, is a very good choice for a not so heavy desert. and you can prepare it one day in advance, so it is an ideal desert if you plan to cook a big meal for your family or friends. i topped the apple snow with whipped cream and a pralin filling from the french cooking blog aux délices d’aurélie. and if you are interest in the taste the waste theme, there is a cookbook with this title published recently, we have an iniative in germany called foodsharing and in berlin there are two ladies taking care of culinary misfits. enjoy browsing. everything deserves a second chance. preheat the oven to 220° C. wash, peel and core the apples. set them on a baking tray or in a baking dish and bake for about 30 minutes until soft. the baking time depends a bit on the apples, so keep an eye on them. once they are ready, strain through a large sieve or better through a potato ricer. finally stir in the the vanilla sugar and allow to cool down. taste the apple puree and decide if you want to add sugar or lemon juice to the beaten egg whites your are going to prepare now. beat the the egg whites until very stiff and pour in little by little the sugar or lemon juice. 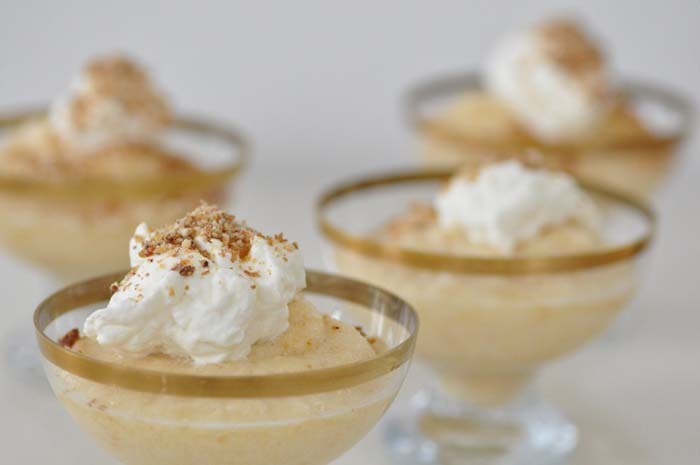 fold the whipped egg whites in the cold apple puree and divide between small desert bowls. allow to chill before serving. you even can prepare the apple snow until that point one day in advance. to prepare the pralin, place the hazelnuts and almonds in a large frying pan and roast until golden. add the sugar and caramelize. now you need a sheet of baking paper which you place on the worktop or a large breadboard. 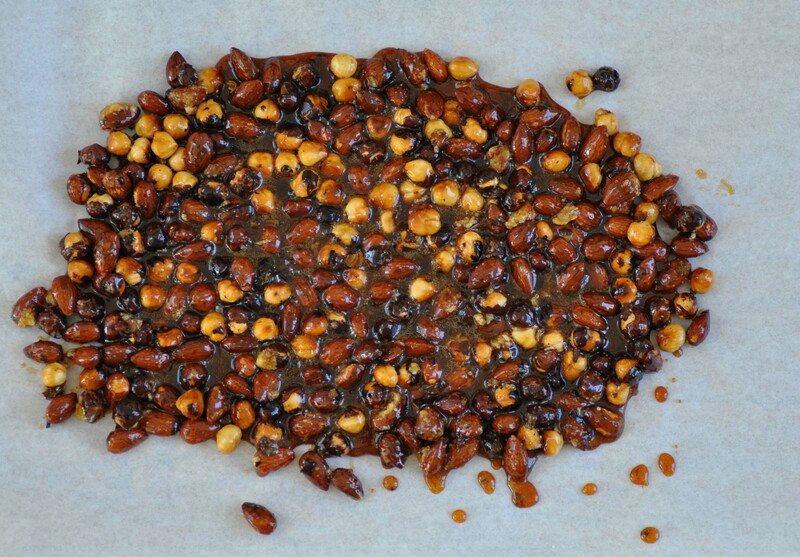 pour the caramelized hazelnut and almond mixture on the baking paper. eventually flatten it a little bit and allow to cool down. after half an hour it should be cold and firm so that you can break it into pieces. already at that point it is a delicious sweet. don’t hold yourself back as for the pralin for the apple snow you will only need one third of the whole bark. put one third of the caramelized hazelnut and almond bark into the food processor and add 2 crêpe dentelle. in the case you cannot find crêpe dentelle, you can replace it with other kinds of wafers. 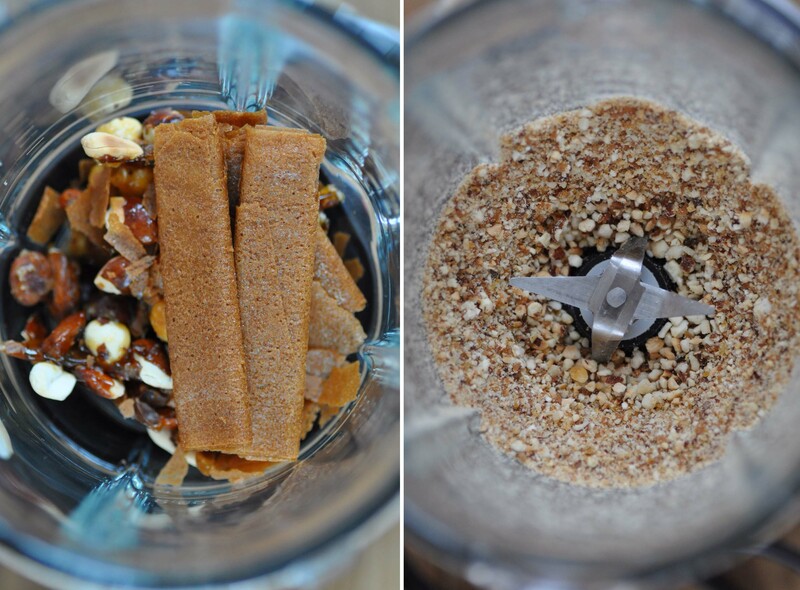 blend until everything is chopped in small pieces. to store the pralin, it is important to put them in an air-tight container or glass. whip the cream and add one tablespoon of sugar while whipping. 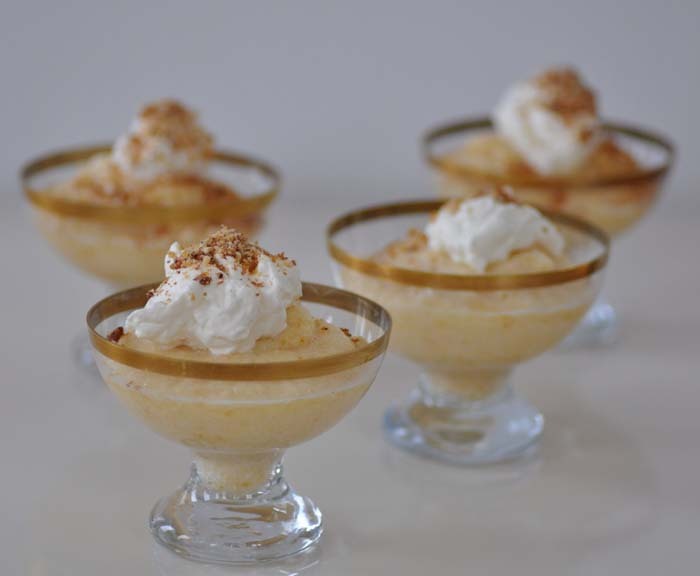 immediately before serving, top every desert bowl with a little bit of the whipped cream and about a teaspoon of pralin. but i recommend to place some more pralin on the table that everybody can help themselves if desired. den ofen auf 220° C vorheizen. äpfel waschen, schälen und das kerngehäuse entfernen. die äpfel auf ein backblech oder in eine auflaufform setzen und etwa einhalbe stunde backen, bis die äpfel weich sind. die backzeit kann je nach apfelsorte etwas variieren, so dass man sie im auge behalten sollte. wenn die äpfel weich sind werden sie durch einhieb gestrichen oder noch einfacher, durch die kartoffelpresse gequetscht. in das apfelpüree dann den vanillezucker einrühren und abkühlen lassen. bevor du nun das eiweiß schlägst, probiere vom apfelpüree und entscheide abhängig vom säuregehalt der äpfel, ob du zum eiweiß zucker oder zitronensaft hinzufügst. das eiweiß sehr steif schlagen und peu à peu den zucker oder den zitronensaft dazugeben. hebe den eischnee unter das erkaltete apfelpüree und teile den apfelschnee auf desertschälchen auf. stell den apfelschnee vor dem servieren einige zeit kalt. bis zu diesem punkt kann der apfelschnee auch bereits einen tag im voraus vorbereitet werden. zur herstellung des pralin, die haselnüsse und mandeln in eine große pfanne geben und golden anrösten. zucker dazugeben und karamelisieren lassen. ein stück backpapier direkt auf die arbeitsplatte oder auf ein großes schneidebrett legen, um die karamellisierten haselnüsse und mandeln zum erkalten darauf zu gießen. eventuell etwas platt drücken und komplett erkalten lassen. nach etwa einer halben stunde sollte das karamell kalt und fest sein, so dass man es in stücke brechen kann. bereits jetzt hat man eine ganz ausgezeichnete süßigkeit. du brauchst dich auch nicht zu beherrschen, für die zubereitung des pralin für den apfelschnee benötigt man maximal ein drittel des gesamten karamells. ein drittel der karamelisierten haselnüsse und mandeln in den mixer geben und zwei crêpe dentelle dazugeben. die crêpe dentelle kann man auch durch andere Waffeln ersetzen, falls sich keine crêpe dentelle auftreiben lassen. nun mixen, bis alle zutaten klein gehackt sind. zur lagerung des pralin sollte ein luftdichtes glas oder anderweitige box verwendet werden. sahne steif schlagen und währenddessen einen esslöffel zucker einrieseln lassen. direkt vor dem servieren auf jedes schälchen apfelschnee etwas geschlagene sahne geben und einen teelöffel vom pralin darüber streuen. damit sich bei tisch jeder selbst bedienen kann, empfehle ich die schale mit dem restlichen pralin auf den tisch zu stellen. This entry was posted in autumn, recipes, winter and tagged apple, desert by The Cook. Bookmark the permalink.